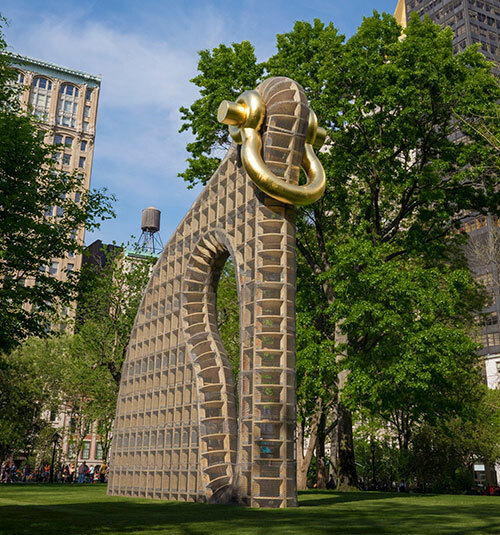 According to the recent news release issued by the Madison Square Park Conservancy, Martin Puryear will represent the United States at La Biennale di Venezia 58th International Art Exhibition with the help of the Conservancy. You will remember Puryear’s stunning BIG Bling that graced Madison Square Park through the summer of 2017. The Conservancy, which has developed an international reputation for its art program, will be making history with this collaboration. As its release states, “The exhibition marks the first time in the history of the Biennale that the U.S. Pavilion will be organized by an institution whose visual arts program is focused exclusively on public art.” The 2019 U.S. Pavilion at the Venice Biennale is commissioned and curated by Brooke Kamin Rapaport, the Conservancy’s Deputy Director and Martin Friedman Senior Curator, who steers the Park’s exciting ongoing art program. The Biennale exhibit will be on view between May 11 and November 24, 2019 and will feature a new body of work especially created by Puryear for the pavilion as well as a site- specific piece for the pavilion’s forecourt. Darby English, the Carl Darling Buck Professor at the University of Chicago, will collaborate with Rapaport on text panels and interpretive materials related to the exhibition. He will also author a major essay in the exhibition catalogue. Tod Williams Billie Tsien Architects will serve as exhibition designers, working with Puryear and Rapaport on the layout of objects in the interior galleries and outdoor forecourt. Paula Scher of Pentagram will realize exhibition and catalogue graphic design. Anne M. Wagner, Professor Emerita at the University of California, Berkeley, will write a catalogue essay.